I Love the Smell of Fossils in the Morning! Can’t hear those buzzers and bells. Because they really didn’t. I had recalled that there is a particular “tang” in the air when we hammer the rocks at William Lake and Airport Cove. 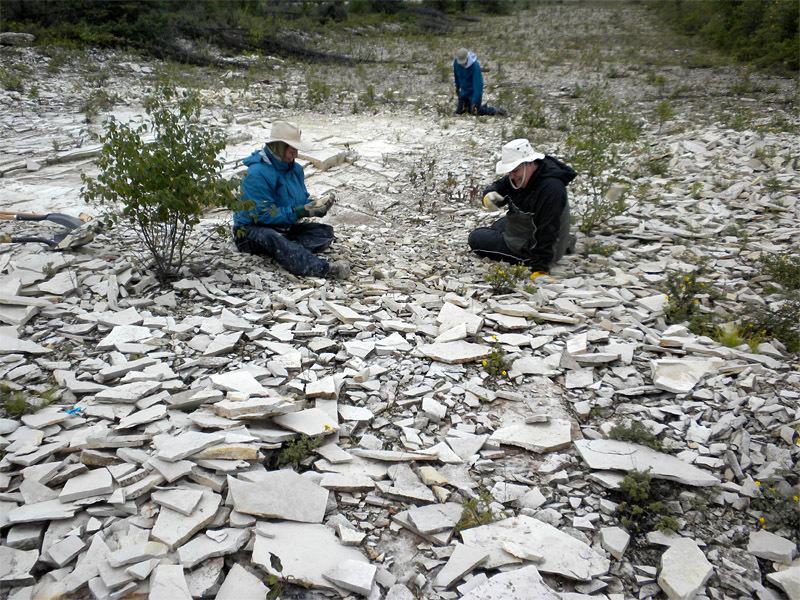 Part of this tang may result from the strata at those sites being dolostone rather than limestone, but they also share a subtle aroma that is lacking at many other dolostone fossil sites. What that smell is I really don’t know, but it was entirely absent in the flat scent palette of these Ontario strata. At William Lake, there is often ample opportunity to smell the rocks. Here, Debbie Thompson and Michael Cuggy work through one of our previous rubble heaps, while in the background I am examining a “new” dolostone bed. You might think it odd that I would sniff rocks. I don’t really go around purposefully inhaling these aromas, but doing this sort of paleontological work one really has no choice about it. The fossils are often tiny and obscure, and after you split the rock you have to get your nose right up to it as you peer through a hand lens. If the rock has a dust coating then the surface must be wetted to make the fossils visible, and if you aren’t near to one of the water pails you end up using spit instead. I have to admit that there have been times I have licked the surface of a rock in my hurry to see what a particular small fossil might be. So I know very well what those fossil-bearing strata smell like! Other fossil sites also have distinctive smells, of course. In my scent memory, it is easy to conjure up the whiff of bitumen in the Eramosa lagerstätte of Ontario, the lime dust of the Tyndall Stone quarries in southern Manitoba, and the sulfurous pong of a pyrite-rich locality on the west coast of Newfoundland. Elsewhere, the rock-smell is obscured and overwhelmed by local factors. In some working quarries the pervasive odour may be the diesel fumes of operating machinery. There are places in the modern intertidal zone where the combination of salt and microbial scum completely masks whatever smell the rocks might have. And woe betide you if you need to work along a shore where purple sulfur bacteria have taken over the decomposition of seaweed mats! Could it be at all useful to recognize that rocks bearing particular kinds of scents might also bear particular kinds of fossils? Given the limited olfactory abilities of humans, I doubt that we are ever going to find an unusual fossil site by smell alone. But perhaps the absence of a particular smell might be good negative evidence: it might tell us that a rock lacks the chemical makeup that would make it a likely host for fossils preserved in a particular way. Is it too much to hope that in the future we could train a fossil-sniffing beagle, which would rapidly scour outcrops for the faint spoor of long-passed eurypterids? Thanks for sharing this story! In addition to spitting on rocks, I also do a game of scratch and sniff with oil shale. Most people say they “recognize the smell,” but they can’t put a name to it. It’s a good segue into talking about fracking. Thank you Kate! I’m sure that all of us are strongly affected by smells, but I guess we have evolved to always depend on sight first, and then hearing, with sense of smell way down the list. Fracking: now that is a challenging topic! Mario, are you part beagle? More of a Sheep Dog I would say, but with a taste for Eurypteribs, the BBQ kind! Yes you are right Graham! Rocks do have a particular scent like the Oil Shales at Kettle Point ON,… the Bitumen smell at Lincoln / Dundas Quarry in the Silurian dolostone….. Guess you are using all your senses to hunt for fossils… like a blood hound … sniff sniff…. on the trail on some fossil from the distant past…. Peter, I don’t use all my senses. But we should learn how to. Graham, its a great story! I have some modern plant taxonomist friends who, well, taste and smell some rainforest plants as an aid in identification, which can be a wee bit dangerous as many plants are toxic. So … I had a fossil leaf and handed it to my friend to see if he knew what it was … and he licked it! Unfortunately this didn’t yield an identification. But I agree on the smell. Coal seams, freshwater shales, and other good sources of plant fossils all have a distinctive smell. Or was that my field boots … ? Thanks Dave. That is interesting about the plant taxonomists! I guess we need to find out somehow whether the fossils themselves have a smell that is different from that of the rocks. I doubt we can get grant funding for this, though . . . In 2010 fall , I visited the ROM excavation site Eramosa Lagerstatten with Stu ; PvB was having car trouble and unfortunately did not make the journey that day… but thinking about it… the hint of bitumen was in the air… what a wonderful Lagerstatten… seeing phyllocarids that glowed an eerie blue in sunlight against a black matrix…. Thank you Peter. 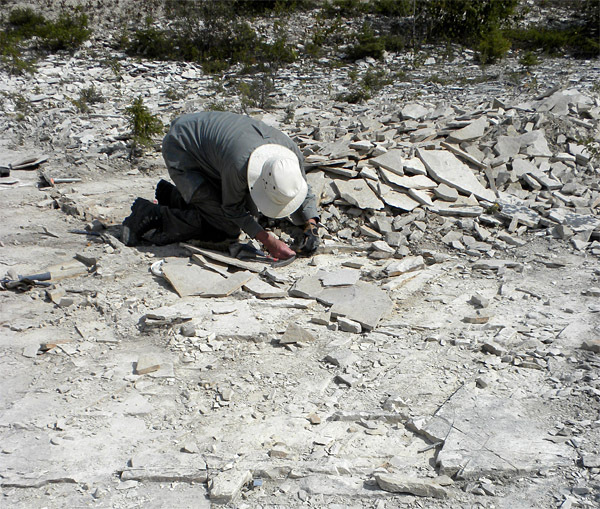 You should record the smell of every fossil site you visit!